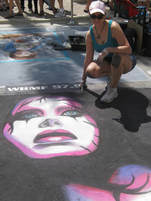 Gina is a pastel portrait artist and native Floridian. Professional makeup artist and Personal Beauty Adviser for Sephora. Gina is often assisted by her daughter Becca Bartlett.